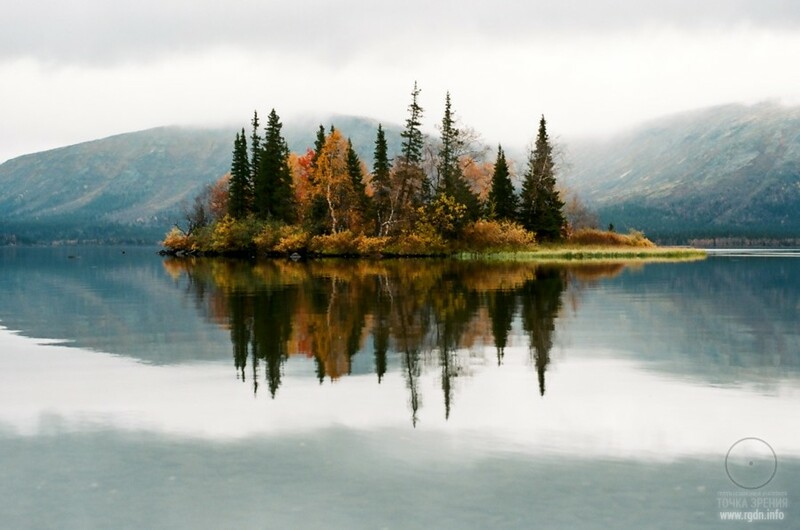 Here we would like to talk about such place as Lake Seydozero, which is very interesting due to numerous local mysterious phenomena, myths and stories. 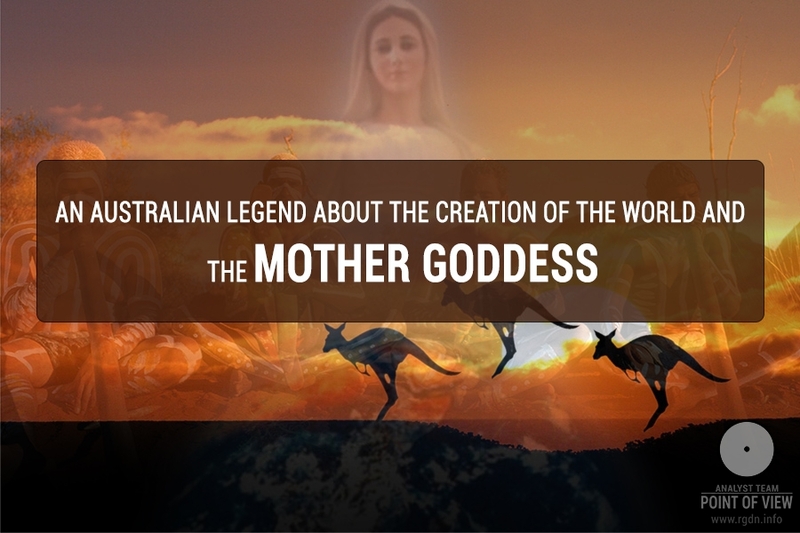 Frequent UFO and yeti sightings, anomalous natural phenomena, traces of ancient civilization activities, and the inimitable beauty of local nature – all these attract researchers, travellers, psychics, and mystery fans. At that, various studies of this place produce more questions than answers. Lake Seydozero or Seidozero (Russian: Сейдозеро, Kildin Sami: Сейдъявврь).In translation from the Kildin Sami seyd (seid) means sacred. 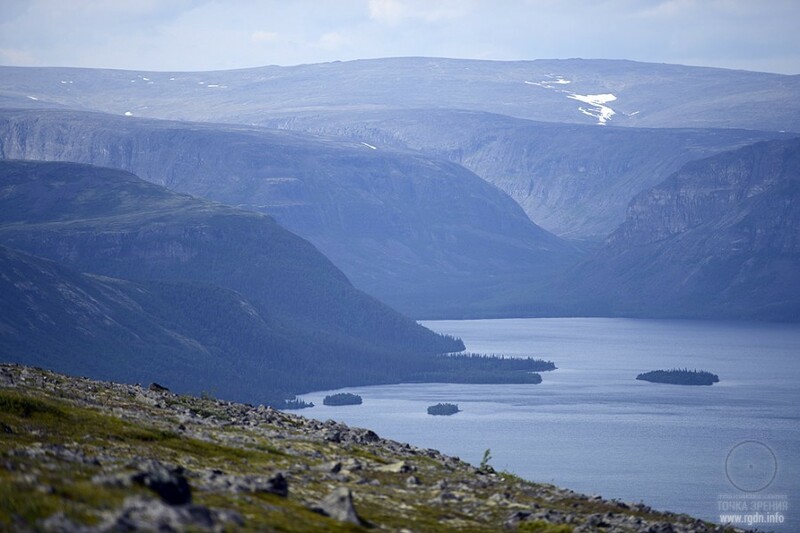 The lake is located in Lovozero tundra on the Kola Peninsula (MurmanskRegion, Russia), near the villages of Revda and Lovozero, which area is called Luyavchorr (Russian: Луявчорр – “mountains near the lake of power”). The lake is situated 189 m above sea level. The length of Lake Seydozero is 8 km; its width is 1.5 to 2.5 km. A mountain river Elmorayok (Эльморайок) flows into the lake, while the river Seidyavryok (Сейдъяврйок) flows out of it, carrying its waters to LakeLovozero. Mountains that protect the lake valley from northern winds create a special microclimate here, and so local nature somewhat differs from ordinary polar nature. The Sami people (also Sámi or Saami; Sami: sámit, sampelaš; Finish: Saamelaiset, Swedish: Samer; traditionally known in English as Lapps or Laplanders) are an indigenous Finno-Ugric people inhabiting the Arctic area of Sápmi, which today encompasses parts of far northern Norway, Sweden, Finland, and the Kola Peninsula of Russia. 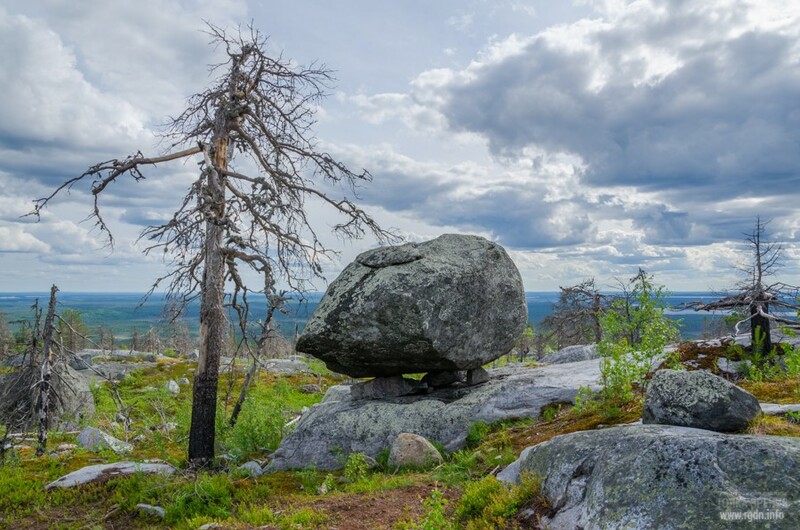 Since the Scandinavians called them lappar or lapper, while the Russians called them lopari (лопари), lopniane (лопляне) or lop’ (лопь), there emerged the name of Lapland (Lapponia, Lapponica), meaning the “Land of Lopari”. Sami religion of the past mostly included beliefs in spirits of various natural forces and elements, and shamanism, while contemporary Sami people are ascribed to Lutheranism or Orthodoxy that came here 300 years ago. At that, shamanism, magic and rituals are still preserved, though altered and adapted to the Christian religion. 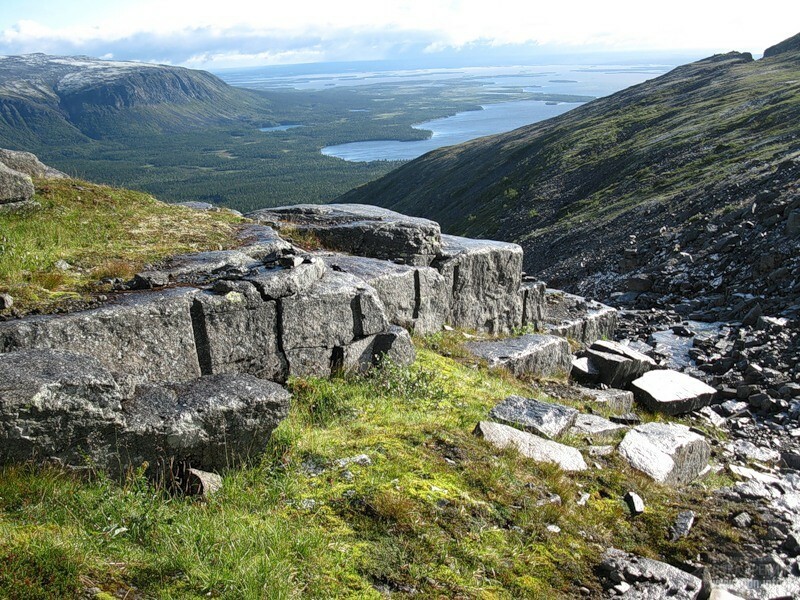 Ancestors of the Sami came to Fennoscandia (Fenno-Scandinavia) from Western Europe 10,000-11,000 years ago. Moreover, the Sami people of Fennoscandia have U5b1 and V genes, which indicates they have common ancestors with the Russian Arctic peoples (genetically they are the closest to Yakut and other peoples of Eastern Siberia), which ancestors lived about 7,500 years ago. 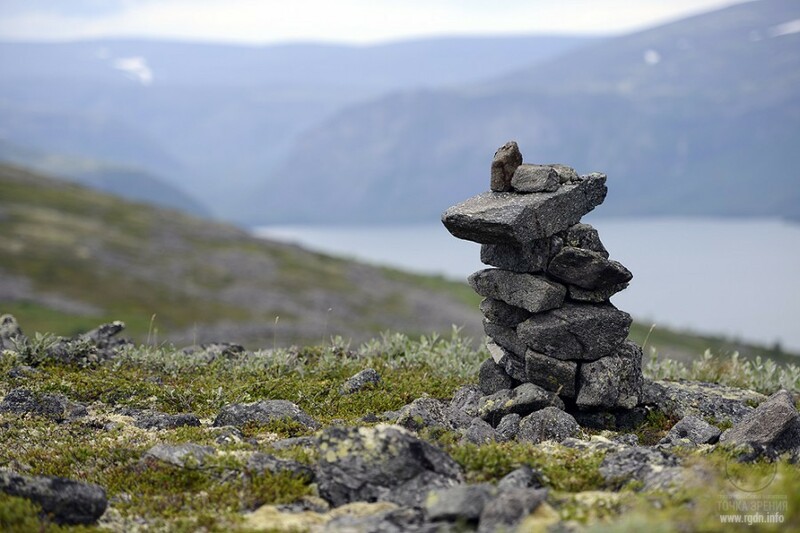 The Sami family tree has a “bottleneck effect”: in the past the number of their ancestors drastically decreased due to reproductive isolation and extreme life conditions of subarctic tundra. The Sami people were known to ancient Greek authors (e.g. in 325 BC geographer and explorer Pytheas mentioned them in his records as finoi) as well as to ancient Roman authors who called them fenni. Knowledge of the four Aspects and the influence of signs: let us refer to the human energy structure in the invisible world and the four Aspects that were mentioned in earlier articles on this website. 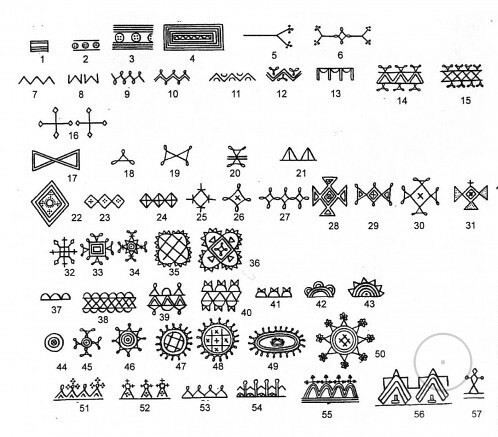 Rigden: ... not only the Yakuts, but also other peoples have mentions of this. 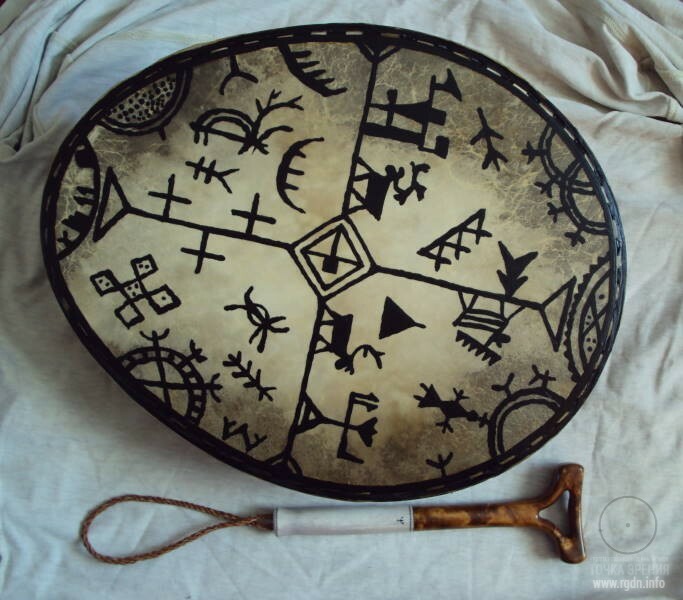 In particular, that at shaman’s disposal there are assisting spirits, which in ritual chants, for example, are called “the force”, “the suite”, or “the army”. They often appear in the form of animals, fish, birds or spirits that travel to the other world for the purpose of performing a certain deed: they negotiate with other spirits, charm, fight spirits of sickness; they prophesy, obtain a desired object, and so on. The knowledge about the four Aspects may also be found in symbolical schemes, e.g. in elements of shaman clothing by which, figuratively speaking, just like by elements of a military uniform, one can determine a shaman’s “rank”, the level of his “astral feats”, and so forth. Rigden: … Yet, let us go back to the ancient designation of the human being – an equilateral cross with a circle in the centre. 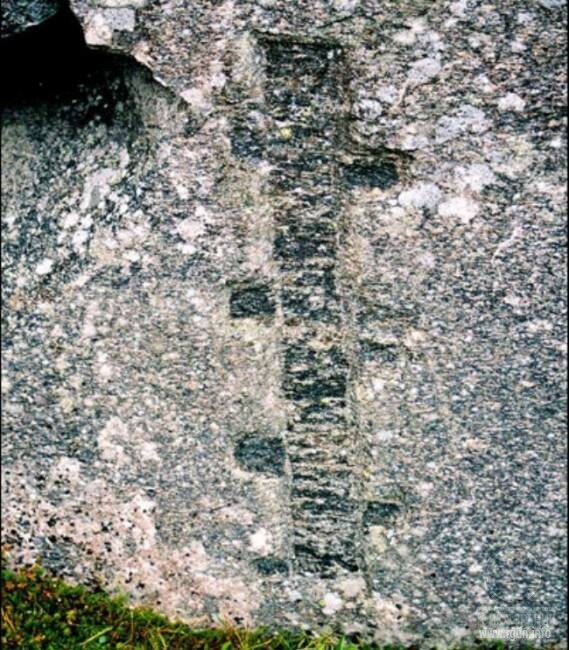 The lines of the cross conventionally designate the four human Aspects: the lateral Aspects (horizontal lines coming from the centre), the Rear Aspect (the vertical line going down from the centre), and the Front Aspect (the vertical line going up from the centre). As I have already said, in associative comparisons the characteristics of these Aspects were allotted to certain forces in space, for example, the four elements, the four seasonal winds, and also the four cardinal directions. At that, the three forces were usually closely interconnected or had negative characteristics of the Rear and lateral Aspects, while the forth one was the leading one, very special in its properties, and had the positive characteristics of the Front Aspect. All these forces were also designated with a cross, which is the sacred symbol of a human being as of the being in whose structure spirit and matter are combined. 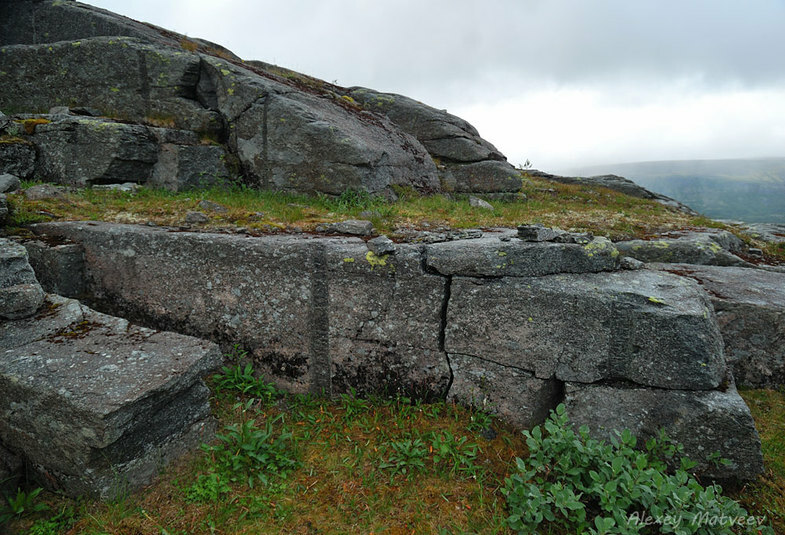 Kuyva is a peculiar petroglyph that, as researchers believe, appeared due to cracks and moss growth, and is reflected in Sami mythology. By one of versions, it’s an image of Orion or Makosh holding a horn of plenty. From a spiritual perspective, it resembles a symbol of human spiritual liberation. It’s poorly visible, but based on other earlier images of Makosh we can assume in her right hand there is a crescent- or horn-shaped symbol of Allat – the power of the creating feminine principle. To the right, there is a spot resembling a bird, which usually symbolized the human Front Aspect, though it’s only a conjecture. Myths and legends of the Sami people noticeably changed under the influence of everyday life, wars and religions of other peoples that came to their land. Nonetheless, they still have remains of the Primordial Knowledge about the spiritual freedom and human inner fight against the animal nature. Numerous expeditions were arranged to this land, which are worth being separately described. 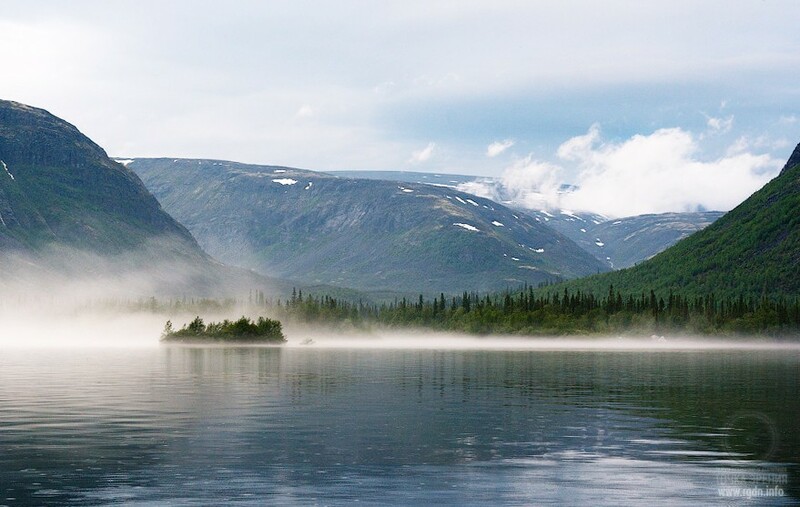 One of the first trips to Lake Seydozero took place in 1887, when the lake was included in the Great Kola Expedition route. Another expedition was arranged in 1922 by the order of Felix Dzerzhinsky and was headed by Alexander Barchenko. 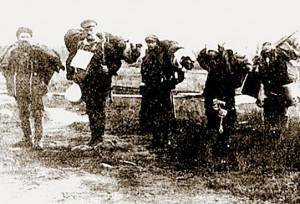 Since Barchenko cooperated with Academician Vladimir Bekhterev, the official purpose of the trip was to investigate an unusual mental disorder called Meryachenie (from the Yakut menerik – “do strange things”) or as Eskimos call it “the call of the Polaris”. Such disorder could emerge in several people simultaneously and was manifested as a sort of an obsession. Below, there are records of an interview with the traveller and geologist Alexander Gurvits who spent 50 years collecting and studying information about one of A. Barchenko’s expeditions. “So, the expedition was formed in Petrograd and left for Murmansk in 1921. They spent a year on preparations: procurement of equipment, devices and foodstuff, selection of participants and guides. 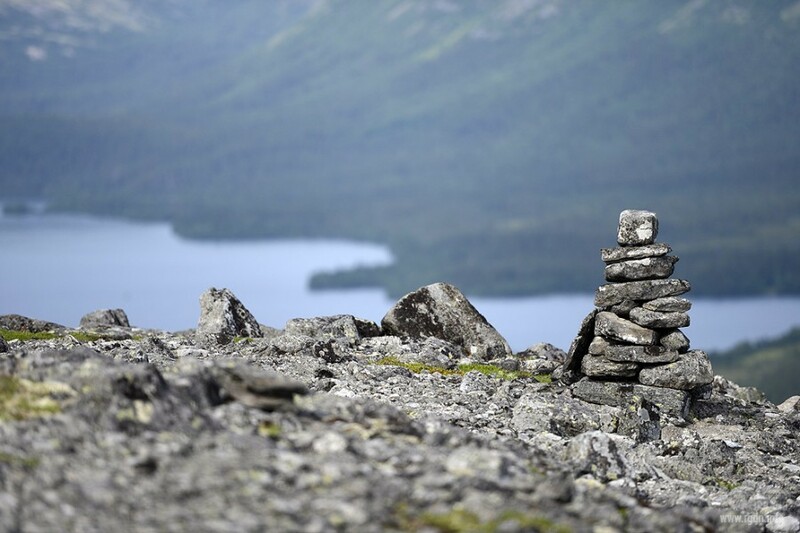 “In translation from the Sami language lu means “stormy”, yavr means “a lake”, and urt means “a mountain”. Altogether, this means “a mountain near a stormy lake”. It’s a volcano that has been extinct for 300 million years and is severely ruined. 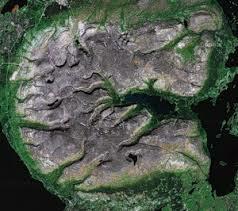 The total area of the lava cone base is 550 square kilometres. 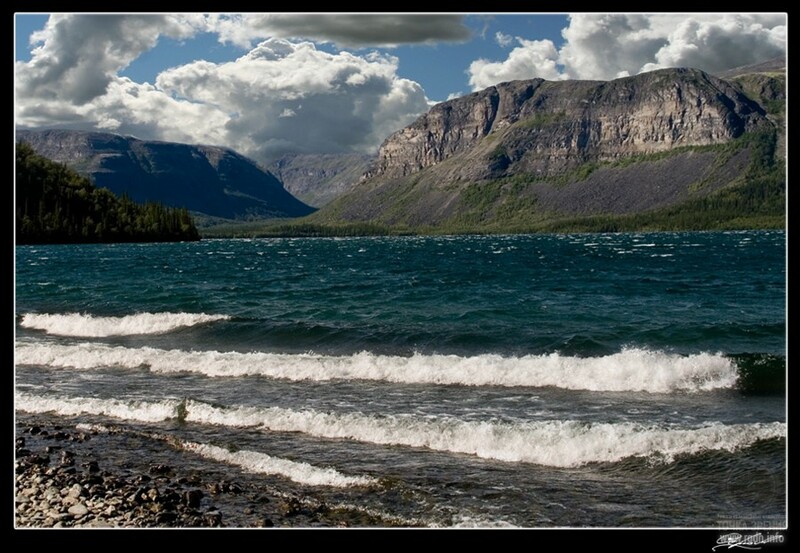 The mountain massive is up to 1,000 metres in height; eroded by cirques on the outer side, it rises above tundra. Inside the mountain mass there is a hollow of 40 square kilometres, filled with Lake Seydozero waters (in Sami Seydozero sounds as Сейдъявврь (Seydyavr), where сейд (seid) means “sacred”, явр (yavr) means “lake”, altogether meaning “the sacred lake”). 12 rivers and streams that don’t freeze even during the polar night flow into the lake. There are also interesting references in A. Novykh’s books, hinting at another possible purpose of expeditions headed by Barchenko, including expeditions to Crimea (Bakhchysarai area and the Southern Seacoast) and to Altai. When Lenin came into power, Archons naturally surrounded him by their people in order to control. However, Lenin was far from being an ordinary person. He had his own high-principled team headed by Felix Dzerzhinsky, who were well aware of the entire game, goals and tasks of Archons. Having come into power, Lenin and his team started actively seeking a contact with Shambala so as to get out of Archons’ influence. Quite likely, apart from everything else Barchenko was indeed searching for a contact with Shambala. At that, in the course of Barchenko’s expedition a strange underground manhole was found. The researchers failed to get inside because of a weird instinctive fear, almost horror they felt at the manhole entrance. One of local inhabitants told, “there was such a feeling as if the skin was stripped off you!” A group photo has been preserved on which 13 expedition participants are depicted near the mystical manhole in the place called a “relict glade”. 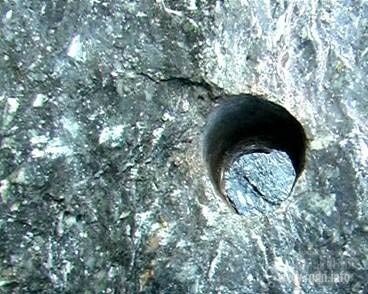 According to Demin, the manhole was buried on NKVD initiative in 1920-30s, because development of uranium ore deposits began near Lake Seydozero with the involvement of prisoners from Revda prison camps. 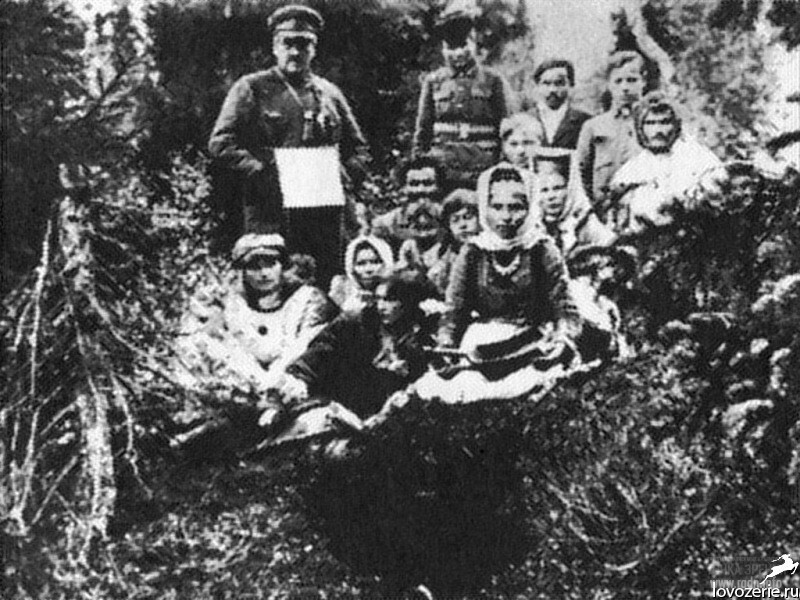 Demin mentions the camp was on the other side of Seydozero near the entrance to Chivruay canyon, whereas the “relic glade” was occupied by NKVD forces. 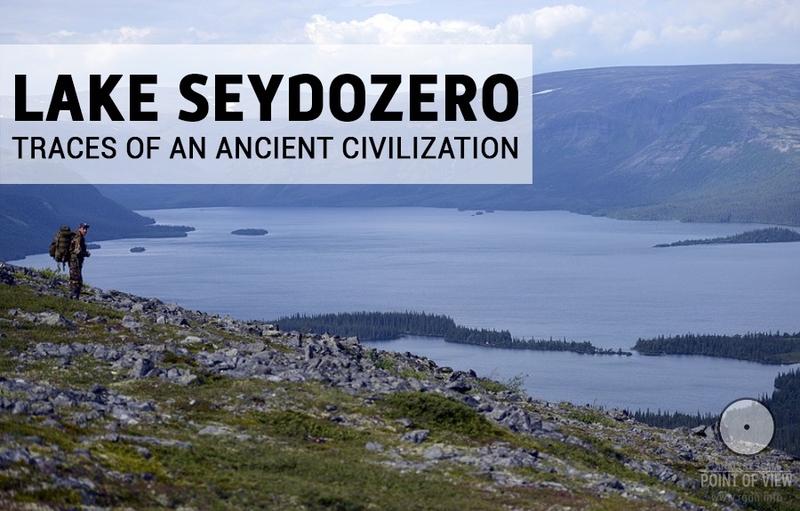 75 years after Barchenko’s expedition two more expeditions headed by PhD Valery Demin and called Hyperborea-97 and Hyperborea-98 came to LakeLovozero. 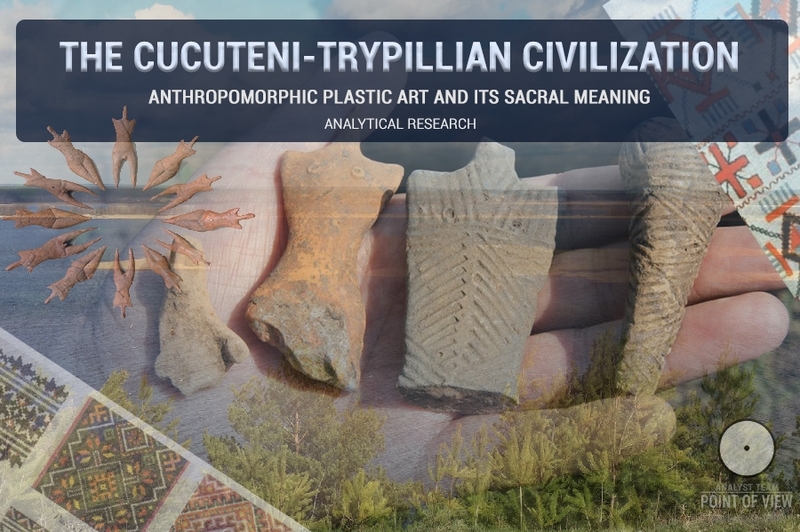 The main purpose of these expeditions was not only to confirm or refute data collected by Barchenko, but also to find traces of Hyperborea – the ancestral home of humanity. Thereafter many researchers and travellers dashed there. 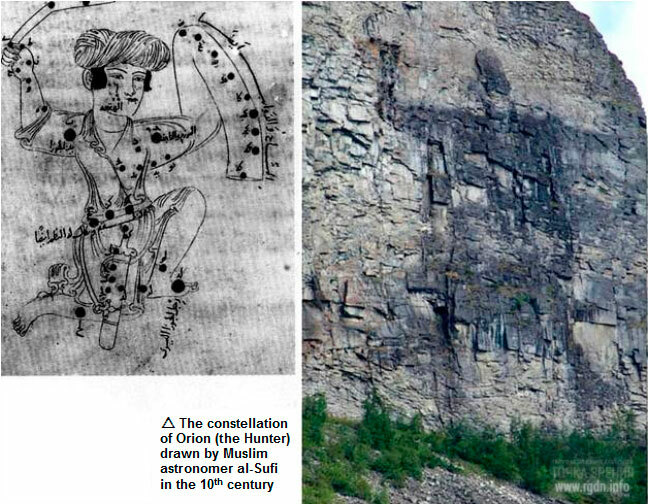 The two expeditions confirmed and photographed the artefacts discovered by Alexander Barchenko: a two-kilometre paved road across the isthmus between Lakes Lovozero and Seydozero, pyramidal stones, and the giant black figure on the sheer rock. At that, participants of the two expeditions made several new discoveries. 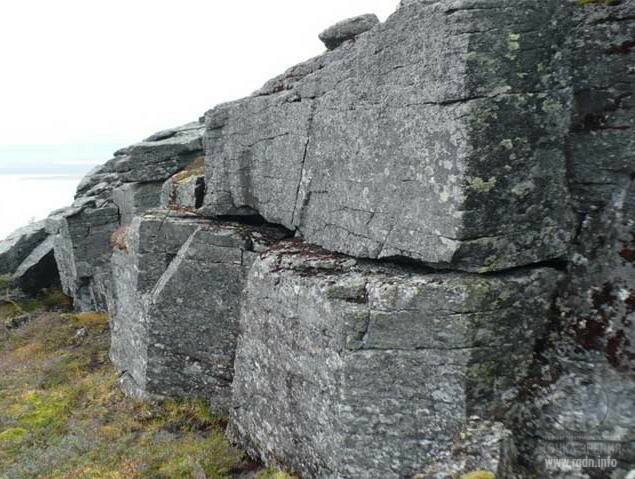 Thus, while ascending Mount Ninchurt they found the ruins of Hyperborea as it is believed! There is a whole cultural centre, weathered, half-covered with rocky soil and thousand times iron with ice crusts and avalanches. In summer 1999 V. Demin initiated another expedition with the purpose of examining Lake Seydozero bottom, but it did not take place due to organisational problems. Nonetheless, Demin went to Lake Seydozero with the same purpose already the next year. Simultaneously, in July 2000 the participant of the Kosmopoisk (“Cosmosearch”) project А. Antipin went there with a task to examine the lake bottom by means of a sonic depth-finder. However, they again failed to do what they planned. Only Demin’s new expedition in July 2001 was crowned with success – they managed to probe and sound the Lake Seydozero bottom. “A marvellous picture emerged before us, when we finally obtained the processed data,” Valery Demin tells. 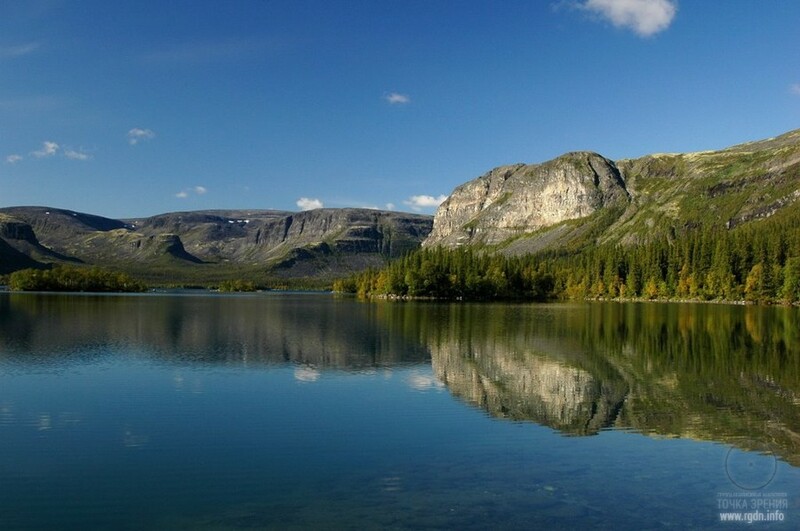 “The total length of Lake Seydozero georadiolocation profile is two kilometres, and it leads from the relict glade to the foot of Mount Ninchurt. Thus, from geology perspective nobody can so far explain how such an underground passage leading towards the mountain was formed in local rocks (where no caves are supposed to exist). The vast hollow under the glade may represent a karst gully; however under the lake bottom we clearly saw not a gully, but a real underground cave with stone floor and ceiling. 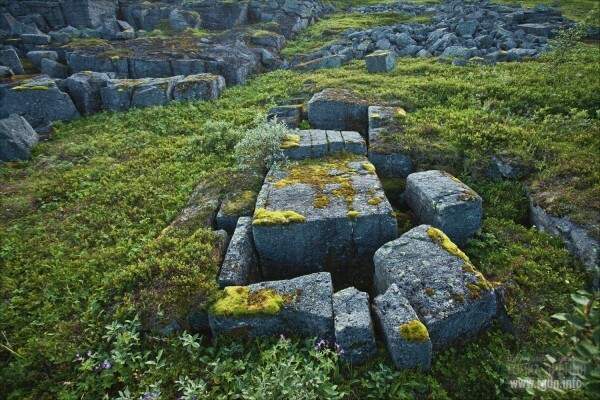 Hence, the double bottom of Lake Seydozero is no more a legend.” Expedition conclusions said stone blocks had an anthropogenic character, while the period of artificial treatment of those blocks varied between the 9th and 8th millennia BC. 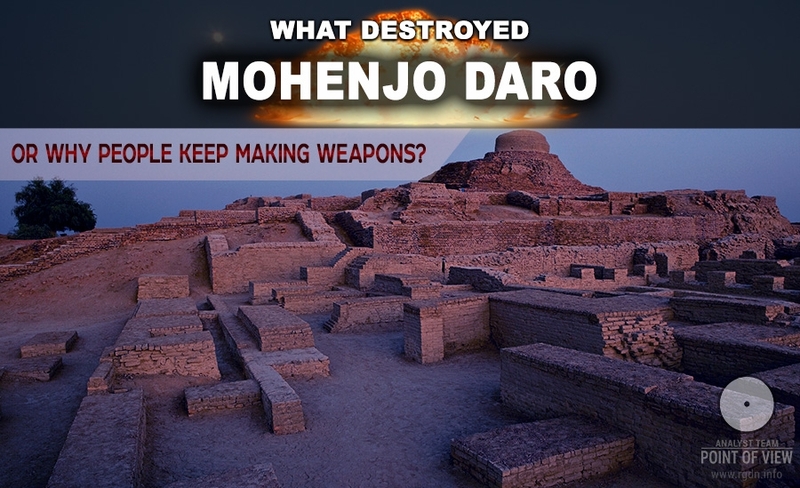 It is noteworthy that due to the ballyhoo and inrush of tourists in 2000 local authorities invited four PhDs from Moscow – experts in biology, geology, military and technical fields, so that they would ascertain if the traces of the so-called Hyperborea had been really found. 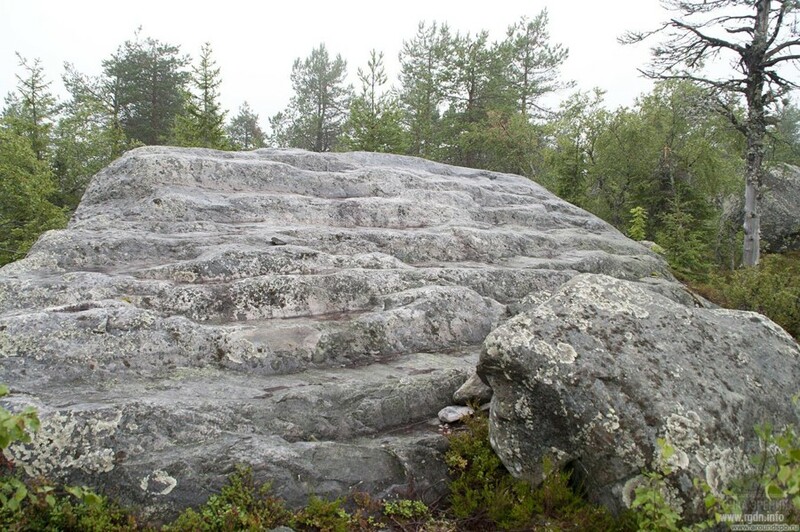 We reached the hundred-metre image of God and Seer (its other name is the Running Lapp) and got upset. 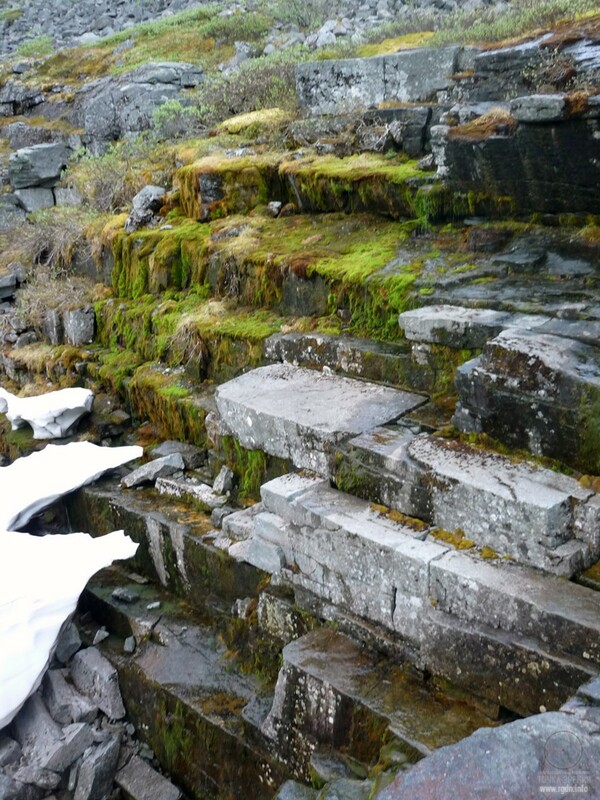 There are two faults (a vertical and a horizontal one) in the rock, above which there is a flat ground overgrown with moss. Having enough imagination and looking from a distance, one can indeed take this for a man’s figure with a nimbus over his head. Yet, nearby it becomes clear there is just a set of cracks, i.e. a natural phenomenon, not a creation of human or alien hands. Mount Ninchurt. 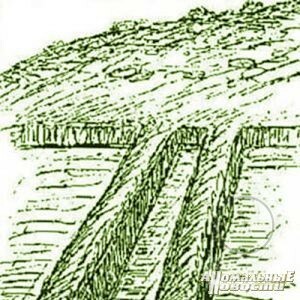 These elevations are supposed pyramids under which by means of special devices researchers have discovered an underground cavity that joins the pyramids with the hollow chambers. The Orion constellation in Karelia? 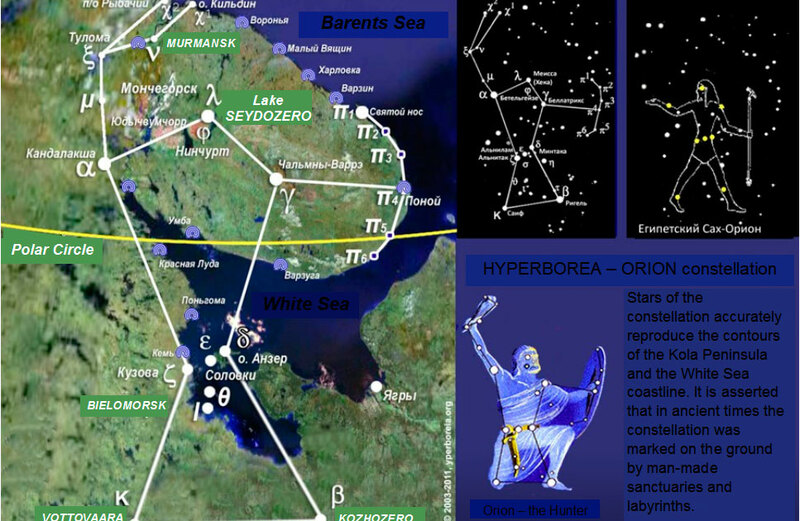 If take the Orion constellation, the layout of which is reproduced by the Pyramids of Giza (Egypt), pyramids in Teotihuacan (Mexico) and Xi'an (China), and project it on the Kola Peninsula map, we will get another sensational resemblance, where Lake Seydozero occupies a place in the centre of Orion’s head, while other major points of the constellation are occupied either by Orthodox churches and monasteries, or by artefacts, e.g. 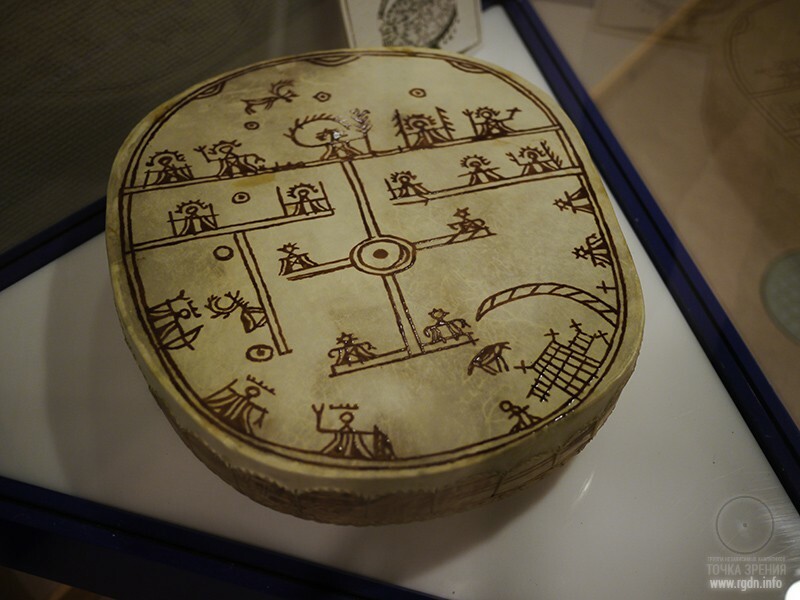 seids and labyrinths (all of them without exception have a shape of a horseshoe or Allat). 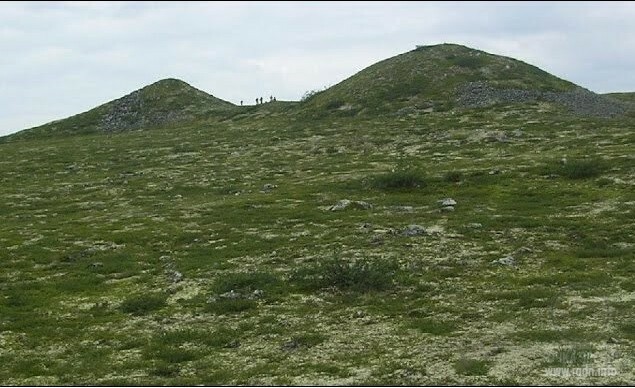 It is noteworthy that a part of the layout is MountVottovaara – a small mountain with a stone amphitheatre, which bears plenty of interesting finds as well (see images below). Let us recall that the Orion constellation may be discerned in the image of Kuyva on Lake Seydozero, too. 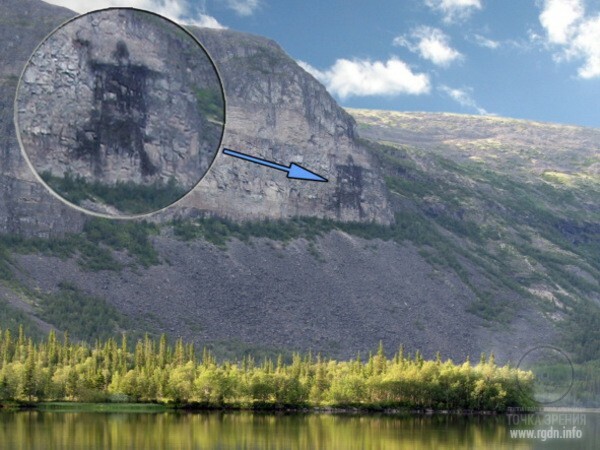 There is another interesting point: mountains that surround the lake look together as a horseshoe or the Allat symbol which is mentioned, for instance, in the article The AllatRa sign. A circle and a crescent. Analytical research. It is also interesting that the firth near Lake Lovozero is called Motka. 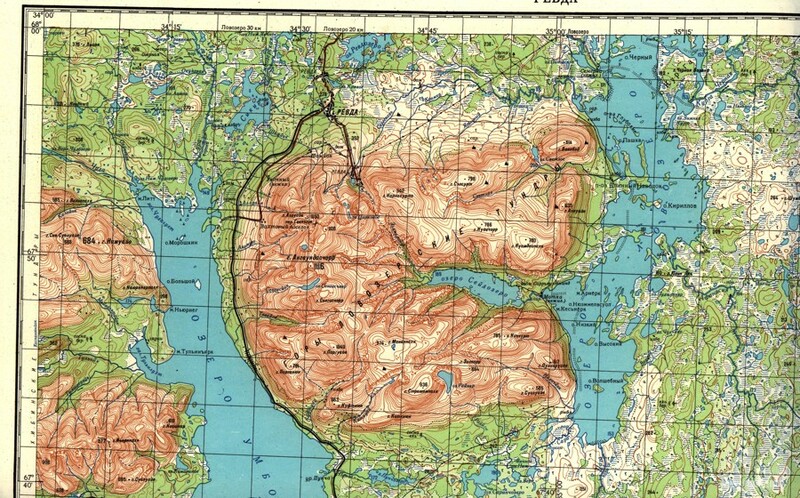 A single little river flows from Motka into Lake Seydozero, and on satellite images the whole picture greatly resembles a womb (sounds as matka in Russian), whereas contours of the mountains resemble an embryo (again, this reminds of the creating feminine principle – the power of Allat). By the way, the adjacent KhibinyMountains also look like this symbol. Drawing a little conclusion, we can say with certainty that many millennia ago this place was inhabited by people who were far from being stupid or wild. 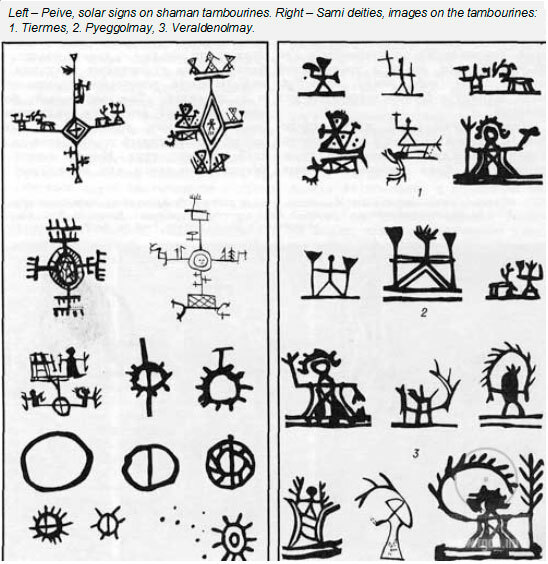 As a matter of fact, judging by signs and symbols preserved among the Sami, those ancient people possessed spiritual knowledge referred to on this website. We can only guess how many more secrets are hidden in this enigmatic land. 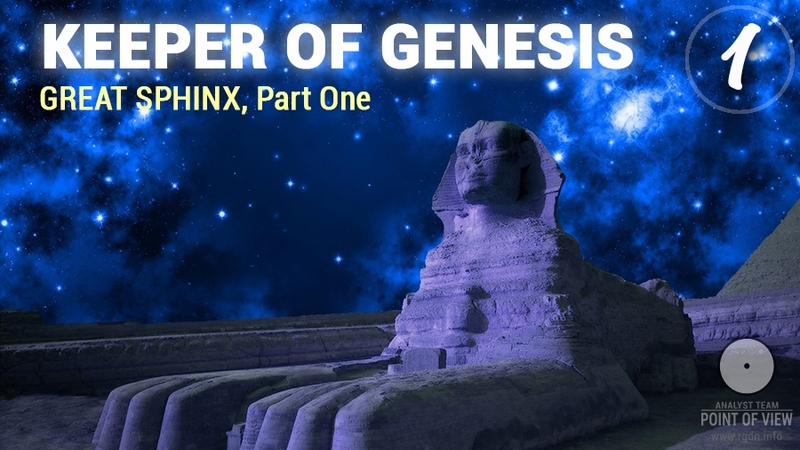 We may endlessly build assumptions, relying on photographs and written sources, but one thing is clear: most ancient complexes on the planet carry knowledge about the human spiritual liberation (fusion of Personality with the Soul). 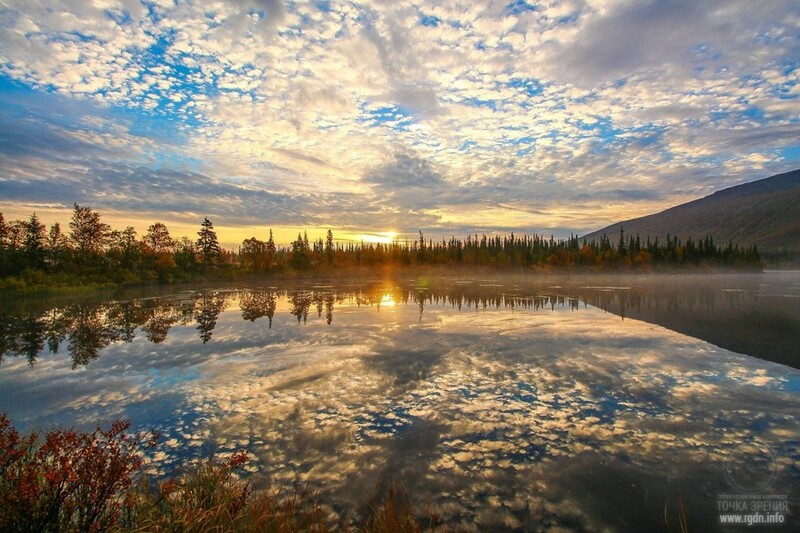 Quite probably, the picturesque Lake Seydozero is one of such places. Furthermore, I have measured distances between Lake Seydozero, Monrepo Park in the city of Vyborg, Mount Vottovaara, and the Stone City in Perm Krai. 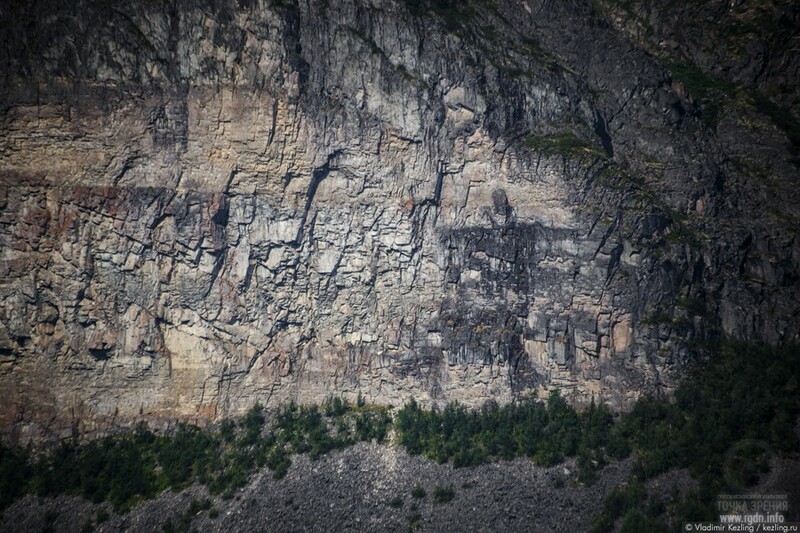 A common feature of all these places is the presence of huge flat stone blocks and stone walls. 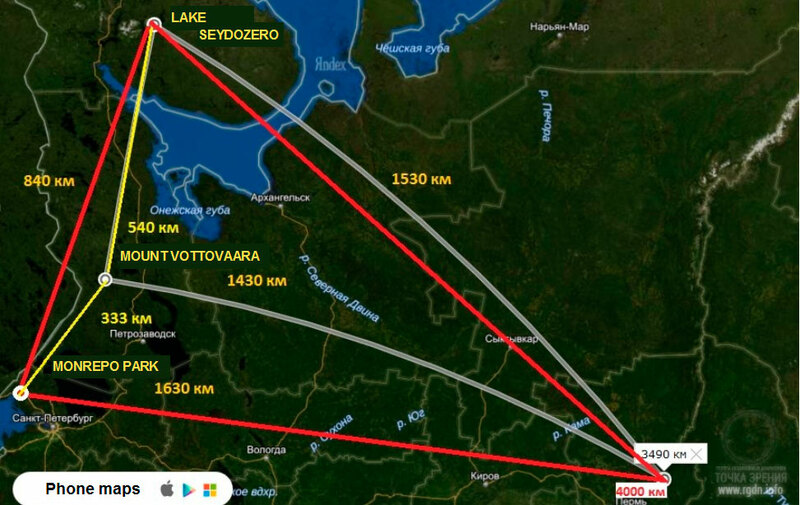 The total distance between the triangle of Lake Seydozero, the Stone City and Mount Vottovaara is 3,490 km.